Anna and Elsa’s Frozen Fantasy returns for another winter at Tokyo Disneyland. With more entertainment, decorations, and food options, this year’s event is a vast improvement over last. Even if you are over Frozen, this event is worth checking out (It’s included in your park admission)! 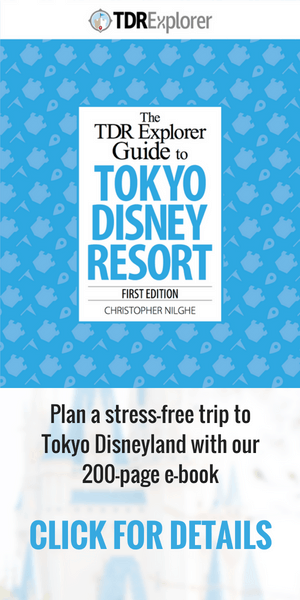 If you’re visiting Tokyo Disneyland this winter, follow our guide to Anna and Elsa’s Frozen Fantasy. Which is running January 12 until March 18, 2016. Check out our trip report where we share our experience! This parade is the best entertainment option this year. The floats and costumes alone are worth watching it. 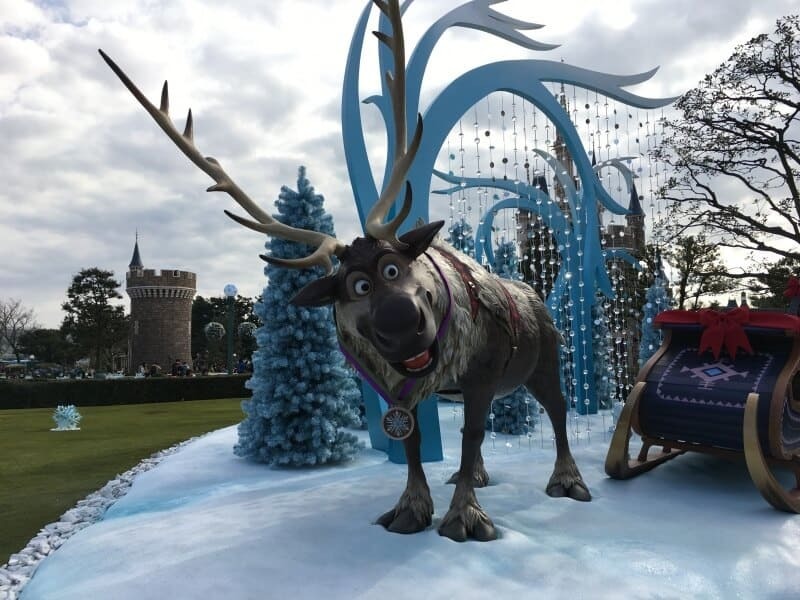 The addition of Hans to the parade is a clever and creative idea that is executed perfectly. If you are tired of “Let It Go”, be warned that the song is featured in the show. 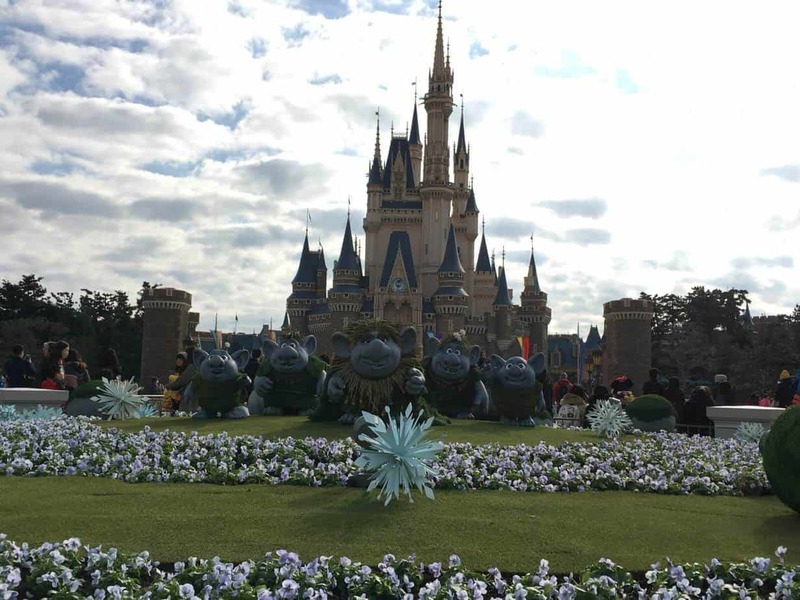 Frozen Fantasy Parade runs 1-2 times a day, check the entertainment schedule for times. “Anna and Elsa’s Winter Greeting” is a short show in front of Cinderella Castle which runs once a day. 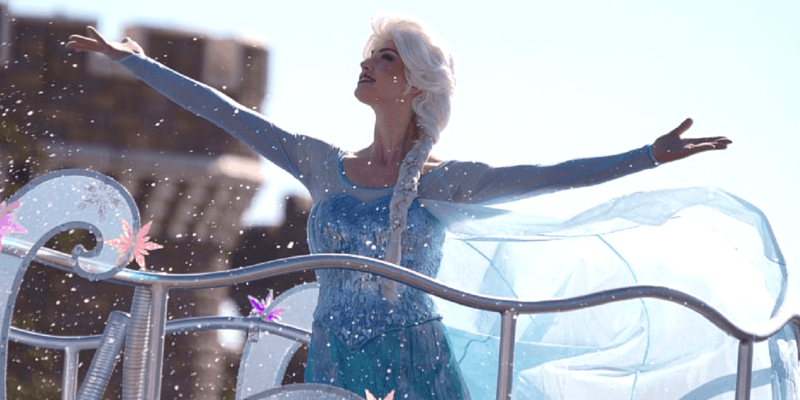 A group of children dressed as Anna or Elsa are chosen to help in the show when Anna and Elsa arrive on their float. While adults maybe not find this overly entertaining, it’s a fun show for younger guests. Especially if they get to participate in the show. Making its return this year is the Winter Version of Once Upon A Time. 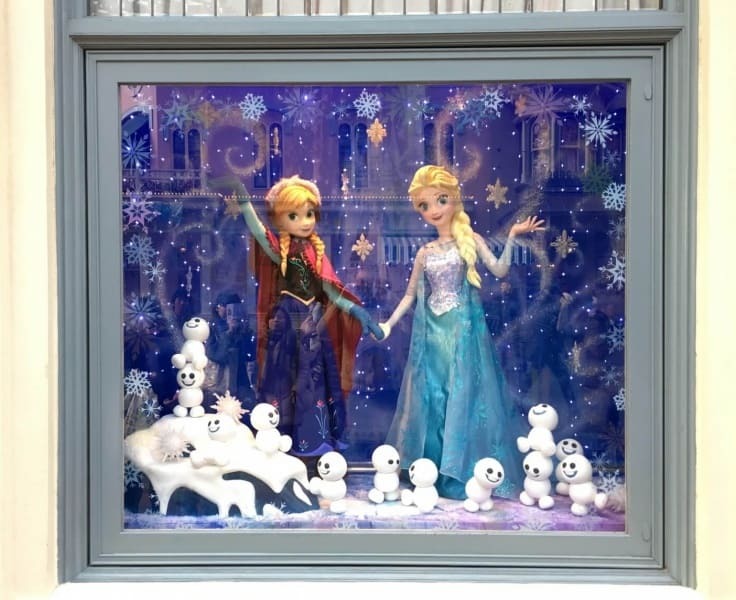 An extra scene featuring scenes from Frozen are added. The show happens 1 or 2 times a day. Check the entertainment schedule for times. 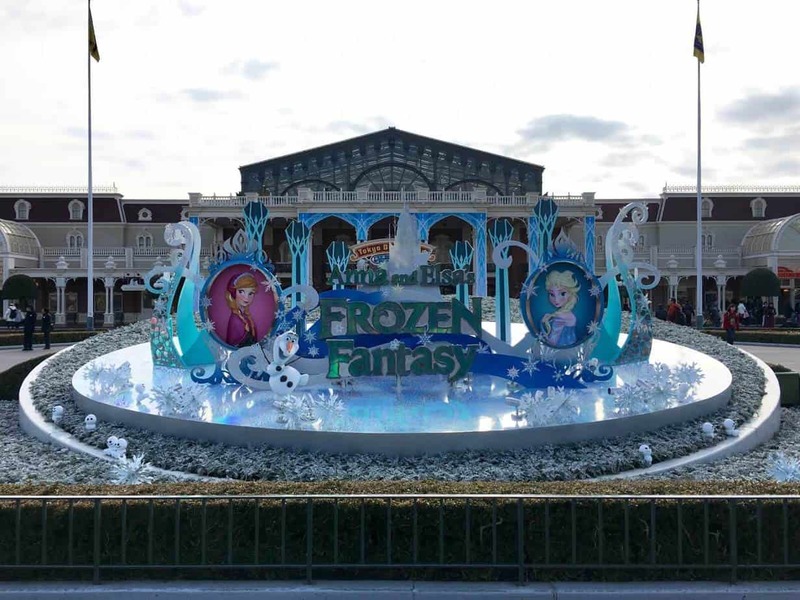 Anna and Elsa’s Frozen Fantasy Display at the entrance to the park! This year brings elaborate decorations compared to the previous year. The entrance to the park has beautiful display, which looks amazing during the evening. 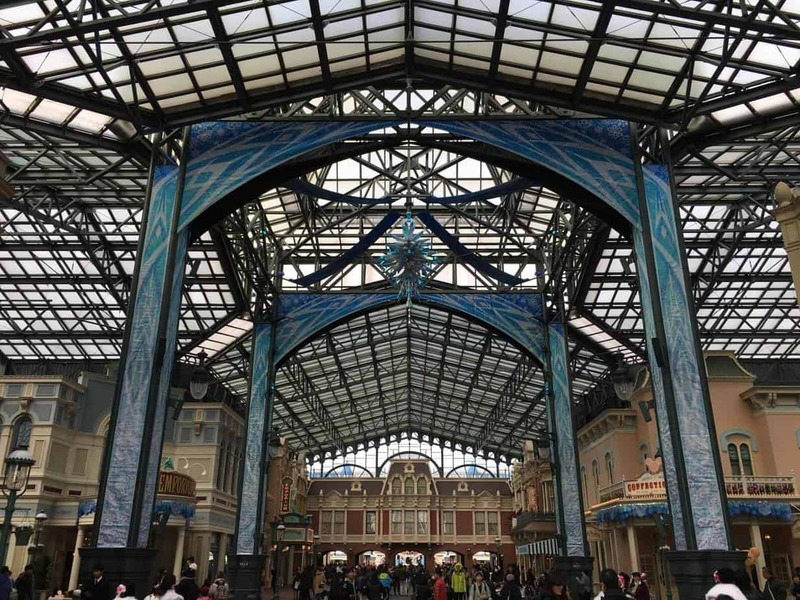 In the World Bazaar the gigantic crystal hanging from the roof makes a comeback with a few improvements. At random intervals the pillars in the middle of the bazaar “sparkle” with accompanying music. A small but noticeable change. 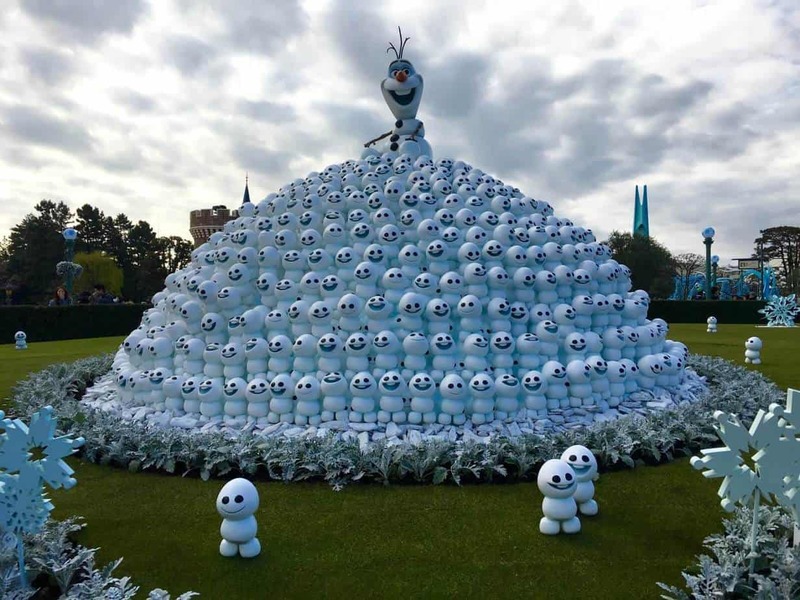 Olaf and his mountain (or throne) of Snowgies! For the first time this year, displays are in the hub area. Olaf and his throne of Snowgies, Sven and his sleigh, and finally the Trolls. The throne of Snowgies is my favourite and the most ridiculously creative one. 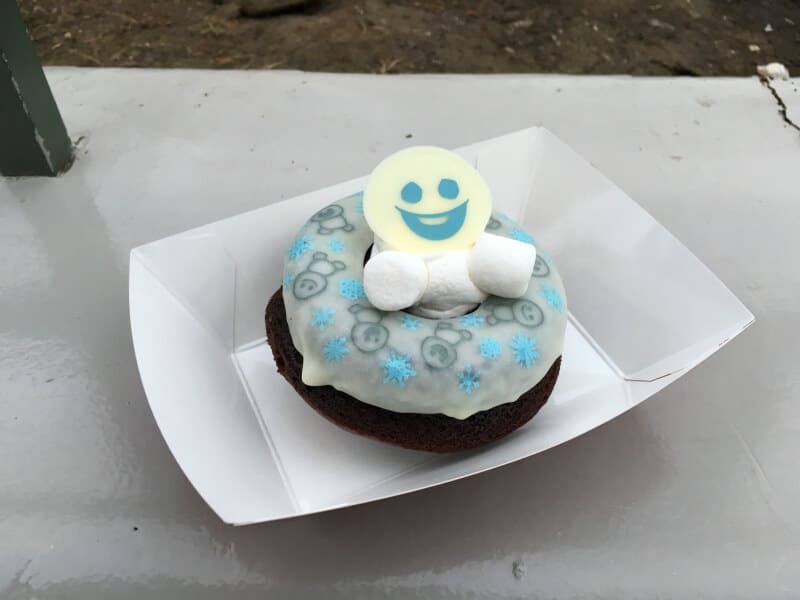 Throughout the park are hidden Snowgies, which are fun to seek out. During my day I found some in Adventureland, Westernland, and Tomorrowland. Even Maihama Station gets into the spirit of Frozen by changing their jingle when trains arrive! It’s not a seasonal event without a variety of merchandise to throw your money at. 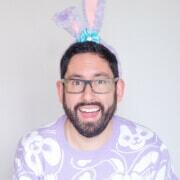 There’s no shortage of adorable merchandise to choose from. 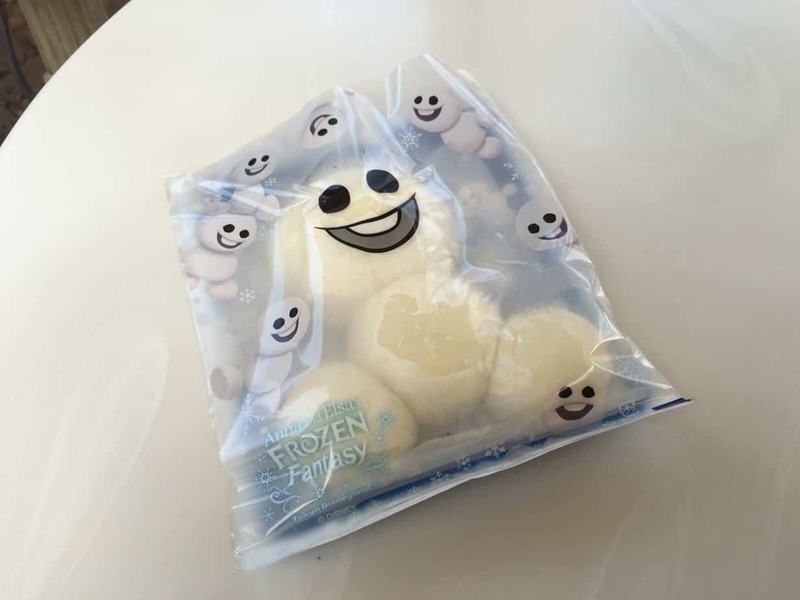 Most notable is the addition of a variety of characters (including Snowgies). We can talk about the merchandise all day, so check out our list of merchandise for you to see for yourself! There’s even an Olaf popcorn bucket! Snowgie steamed bun with meat sauce, salmon cream, strawberry cream, and purple sweet potato cream! The Crystal Palace Buffet is also offering various Frozen Fantasy themed dishes. This year’s Frozen Fantasy is an improvement over last year. Which offers more for their guests and the best part is this is all included in your park admission! Watch our full tour of Anna and Elsa’s Frozen Fantasy! 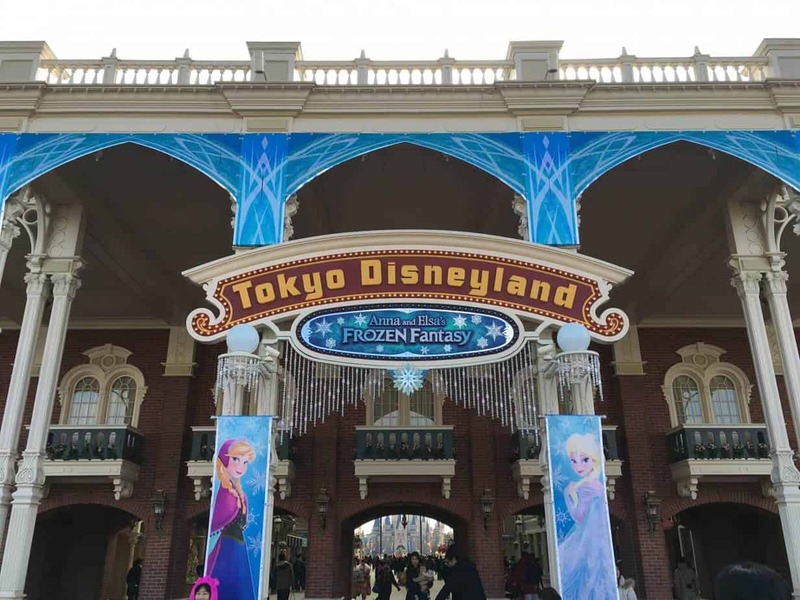 Anna and Elsa’s Frozen Fantasy 2016 at Tokyo DisneylandWe take you on a tour of Anna and Elsa’s Frozen Fantasy at Tokyo Disneyland!